The only thing that can come of this is a genetic monstrosity. Are you watching the new HBO comedy series “Flight of the Concords”? If so, you may have been thinking it was like the Kiwi version of “Tenacious D”. It’s about two lifelong friends trying to make it as a band and having wacky adventures … all with an inflated sense of ego and physical attractiveness. What does this have to do with “Eagle vs. Shark”? Well, aside from Jemaine Clement being the principle actor in both projects, this film also seems like a New Zealand reimagining, only this time of “Napoleon Dynamite”. Both are about socially awkward main characters with quirky families who flirt with the idea of finding a suitable better half. I’m still trying to decide if all of this similarity is an homage or not, so I’ll just talk about the film while my brain cells duke it out over the issue. 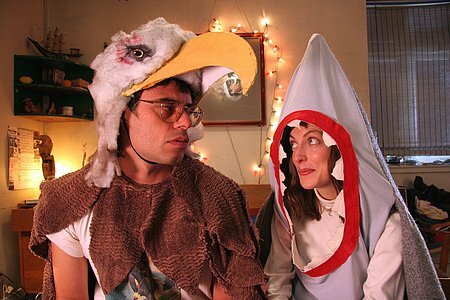 One of the key differences between “Napoleon Dynamite” and “Eagle vs. Shark” is that I’d watch the latter again. I know many people who have tried to tell me that “ND” gets funnier as you watch it over again but after a few tries, I’m calling it quits. It was composed of funny segments but put together, didn’t quite make up a complete film. “Eagle vs. Shark” attempts to solve this problem by being more evenly balanced in its point of view between the lead characters. Actually, if anything, it’s more about Lily (Loren Horsley) than it is Jarrod (Clement). Horsley’s character is chock full of charm and heart and it is her likeability that drives the film. Rather than be simply a series of sadly funny gags, the film follows its narrative thread and much like many other New Zealand films, the offbeat but charming people draw the audience into its web. I have a few issues with its pacing, as the film feels much slower than its running time of under an hour and a half, and there were enough “Napoleon Dynamite” similarities to distract and annoy me, however I’m going to go ahead and recommend this film … with a few caveats. While I’m going to give it the nod and hand a 3 out of 5 to “Eagle vs. Shark”, I think determining if you’ll like this film falls into two categories. You either are a big fan of New Zealand cinema who can ignore the film’s likeness to “Napoleon Dynamite” or you loved that sad, American hick and don’t feel this is a bastardization of that work. All others may want to look around for something else while I figure out why I had to mention “Napoleon Dynamite” by name so many times … I really need to take a writing course. That dude looks like a young Stephen King.